Following the success of its 2017 campaign, the global leader in bulk material handling technologies is repeating its Cougar Cares fundraising programme for National Breast Cancer Awareness Month in October. 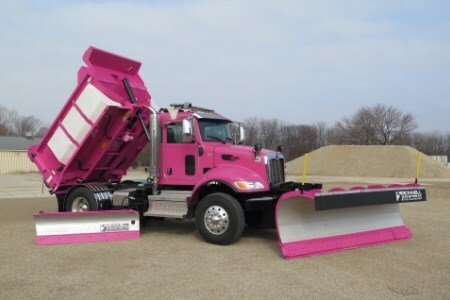 Manufacturing a limited-edition series of Cougar® brand DC truck vibrators painted in the iconic pink colour, Martin Engineering plans to donate US$50 from the sale of every unit to the Susan G. Komen Foundation, with the goal of exceeding its US$3750 donation from last year. “With breast cancer having touched the lives of so many of our employees and customers, we wanted to create a lasting programme to help support patients and families,” said Mark Huhn, Director of the Vibration Products Business Group. Delivering serious power in a small package, Cougar brand 12 V and 24 V DC truck vibrators provide up to 3700 lb (16.5 kN) of vibratory force to improve the unloading of wet, sticky, fibrous or even frozen material. Sealed ball bearings eliminate lubrication requirements, enabling low amp draw, longer run times and a longer equipment life for faster and more complete unloading compared to similar units on the market. Since 1982, the Susan G. Komen foundation has invested more than US$2.9 billion in developing breast cancer research. With treatment options, community outreach, advocacy and other programmes in more than 60 countries, the organisation has played a critical role in virtually every major advance fighting against breast cancer – transforming how the world talks about and treats the disease and helping millions of breast cancer patients become cancer survivors. For years, the Susan G. Komen mission has inspired the passionate employees at Martin Engineering to engage in grass roots efforts, including a team participating in the Peoria Memorial Race for the Cure, a Martin Race for the Cure in the company’s home town of Neponset, raffles and bake sales, with proceeds going to the foundation. Breast cancer is the second most common type of cancer in women. It is estimated that about one in eight women born today in the United States will get the disease at some point. The strides in awareness, testing and treatment of the disease has made it survivable if discovered early and treated promptly. Early intervention is most effective, so regular mammograms remain the fundamental screening test. Now the world’s largest nonprofit source of funding for the fight against breast cancer, the Susan G. Komen foundation is the only organisation that addresses the disease on multiple fronts such as groundbreaking research, community health, global outreach and public policy initiatives in order to deliver the greatest impact. The success is in the numbers, with deaths from breast cancer declining by 38% between 1989-2014. Martin Engineering is proud to contribute to the organisation’s ongoing success.